I guess it's safe to say I'm sort of on this homemade nut butter kick. Well not "sort of", more like "totally, most definitely". 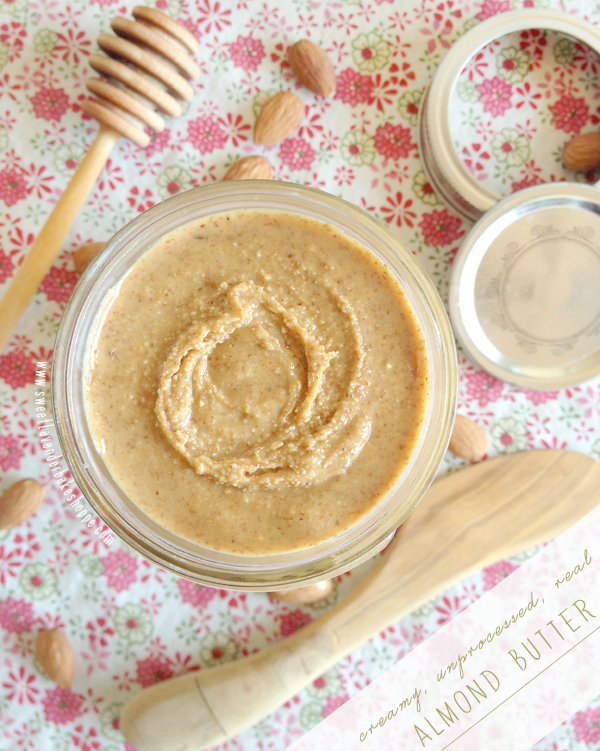 In fact, I'm full blown in love with making my own nut butters! I'm now at the point where I cannot walk down the nut aisle in the grocery store without saying softly out loud, "I can make you into butter...ooooo and you- you'd be so tasty! MmmmMmm oh yes, and you too. You would most definitely be delicious made into a smooth creamy spread..." and so on. It all started when I revisited my love for homemade peanut butter a few weeks ago. That darn stuff was SO easy... and SO delicious... and...SO gone in a matter of days (hello spoon + honey + peanut butter + my mouth!) that I knew I better get to making more, stat. Well "more" in this case was in the almond butter form. 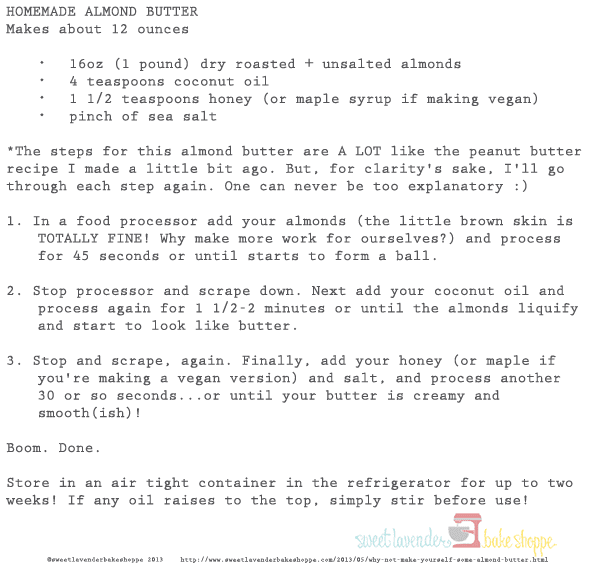 I've made peanut butter a lot of times, but I've never made Almond Butter. Taking a teensie risk, I bought a bag of dry roasted and unsalted almonds. With the brown skin on! This was the only form my store had at the time, and not wanting to wait till there was an unskinned (or blanched version) I decided it was a "Go". Like I said, I've never made this stuff before- but I figured the skins wouldn't be too problematic. Plus, don't the skins have something good for us in them? I don't know...like more fiber...or vitamins...or something? Maybe I'm crazy. The verdict? Amazing. Yummy. Delicioso. Perfect-a-mundo. You get it. The skins provided NO problem at all, everything whirled around and combined perfectly. Also, the roasted-ness (that's a word, right?) totally gave the butter the well rounded, toasted, nutty kick, I was hoping for. 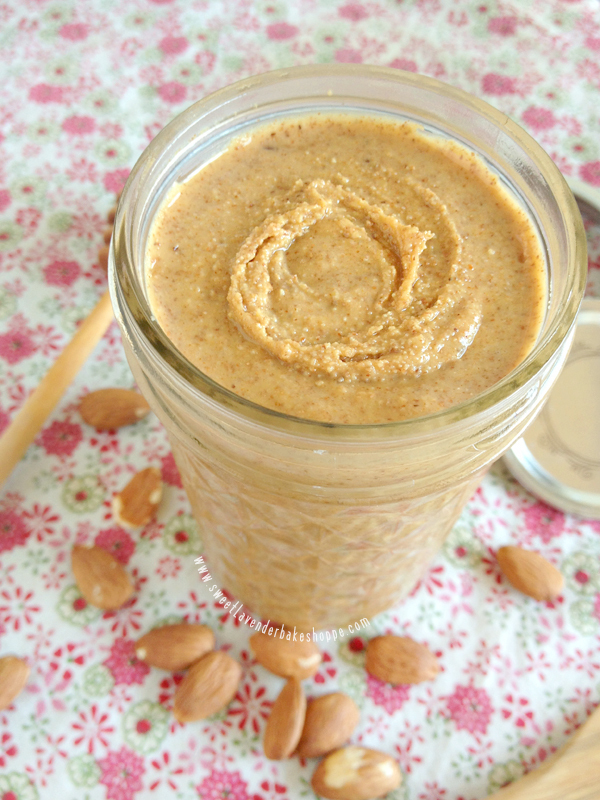 It's smooth, it's nutty, it's packed with almond flavor, and it's just as easy to make as the peanut butter version. Also, I'm totally stuffing it into my face via toast RIGHT now. 1. In a food processor add your almonds (the little brown skin is TOTALLY FINE! Why make more work for ourselves?) and process for 45 seconds or until starts to form a ball. 2. Stop processor and scrape down. Next add your coconut oil and process again for 1 1/2-2 minutes or until the almonds liquify and start to look like butter. 3. Stop and scrape, again. Finally, add your honey (or maple if you're making a vegan version) and salt, and process another 30 or so seconds...or until your butter is creamy and smooth! Store in an air tight container in the refrigerator for up to two weeks! If any oil raises to the top, simply stir before use! Some vegans consider honey to be "un-vegan", so you can definitely leave it out, and replace with a sweetener of your choice. The amount of honey being added is not for sweetness, but rather to balance and marry all the flavors together (as does the amount of salt). Look out pine nuts, sunflower seeds, cashews, etc. No one is safe. My family is going to LOVE me at Christmastime!!! They only eat Almond Butter. (I'm the only peanut butter lover in my family... maybe I was adopted? )Maybe that is also why I married a peanut butter guy, then we can live in peanut butter bliss together. :) I do like almond butter and sun butter, but nothing beats PB! I was totally thinking of you with this post! OMG! I just found your blog and I am in love! I need to try this recipe :)my husband and i love things like this! we make our own mayo and everything! Making your own Mayo? Now I'M impressed! I used to love making homemade mayo (it tastes like nothing else in this world!!!) Kudos to you friend!! !